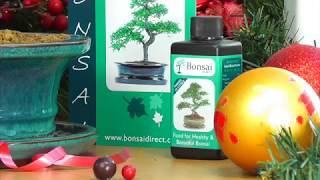 Buy the Exquisite Flowering Bonsai Christmas Gift from Bonsai Direct. This is a wonderful larger sized Oriental Tea Tree Bonsai (Carmona microphylla), an extremely elegant bonsai tree which wonderful leaves and pretty flowers. A great bonsai for warmer rooms and easy to care for. This bonsai is 12 years old and is supplied with a festive Merry Christmas Long pick. Wonderful bonsai which displays both elegance and character. This is an outstanding elegant larger sized flowering indoor bonsai with a 'Merry Christmas' log pick. This simple and elegant tree makes a beautiful bonsai and is potted into a blue ceramic bonsai pot.